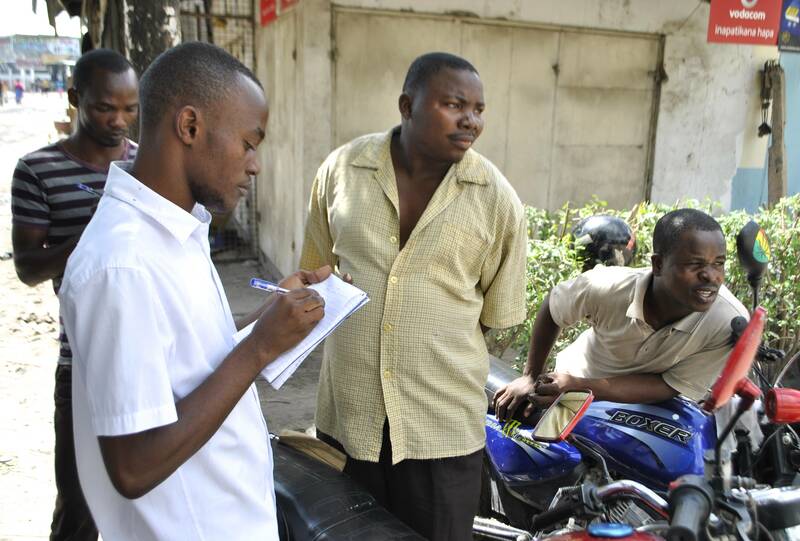 I was recently in Dar es Salaam, Tanzania, examining the potential for a “feedback loop” in some of the regions where GroundTruth has worked, particularly in Tandale, and Keko Machungwa, two informal settlements. GroundTruth hasn’t had a formal program running in Dar, but since our mapping project in 2011 we’ve supplied the community group with computer equipment and supported a local student participant, Msilikale Msilanga, to help out on a regular basis, resulting in a fantastic community blog. We also provided some technical support to the local chapter of Slumdwellers International to do their own mapping in Keko Machungwa. The information outcomes in both pilot areas have been quite impressive—they are much more visible now, and community members can work with information in ways that it’s usually assumed only experts can manage. But we also knew that the potential for transformation on the ground would require, at a minimum, closing the gap between the community and those who could respond to their needs. 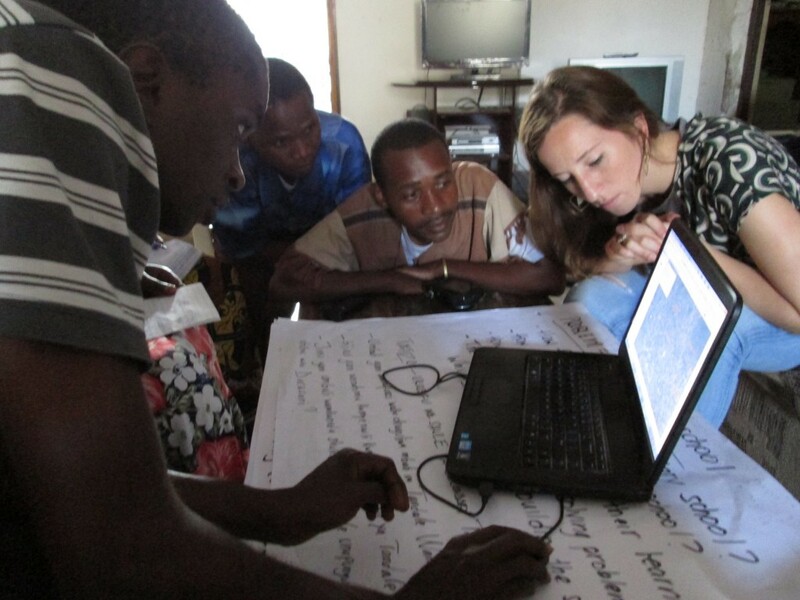 While there, I worked with volunteer Brielle Morgan and Msilikale to provide extra training for the key Tandale bloggers, and to help the group in Keko create their own blog. Then, we discussed the specific goals they wanted to achieve through their information work, their motivations, and how they imagined the information would loop with decision makers and produce the desired ground-level action. I took some of the same questions to meetings with local government officials, NGO leaders, urban experts at the World Bank, and other advisers. In each community, we came up with a target issue that they wanted to work on through reporting/mapping. In Tandale, it was building a secondary school. We had an amazing moment where Msilikale showed the group a map of all the local schools, and they were able to demonstrate where their children must travel to attend school—extremely far! This information could well support a push to build a new local school. Reports/information lead down a media and publicity path—a wider audience is brought to the blog and maps, and therefore to the community, generating a potential interest by mainstream media. Government response follows due to public demand. Reports influence the community itself to take actions, such as, not throwing trash in the river, or addressing various other public problems. Here are six lessons we can take from the experience of learning how to create an effective information circle that allows local voices to be heard, and increases the impact of the grassroots information activists. While this sounds more than obvious, I don’t think it gets nearly enough prominence in technology and development projects in general. It’s a top consideration. Our Dar example illustrates this well: while it’s just next door to Kenya, it’s a world apart. So while in Kenya we’ve looked at how to work closely with community organizations and NGOs to achieve changes, collaboratively assessing information needs, in Tanzania, most people recommend working directly with government officials. Civil society organizations are comparatively few and far between. This is a pretty fundamental difference when it comes to planning the trajectory of your information or advocacy. In Kibera, it’s best to build a coalition of local groups and individuals that have an interest in the topic you’re working on, and slowly build toward incorporating government and larger organizations. But in Tandale, meet directly with the local MP and mayor, ward officers, and individuals from the community. If you expect your average participant (or even average organization) in a feedback loop to understand the political system well enough to navigate through it, you’ll probably be disappointed. In Dar, the expectation was often that “the right people will listen and do something” if we collect and publicize local information and needs. Part of working in this space means helping people find out how things actually work, and what they can do to have a stronger impact. But this doesn’t mean you should do the connecting yourself, or determine the pathways independently of the group you’re working with. It’s about partnering, not leading. This is when teaching the skills needed for investigative journalism can come in handy—why, exactly, isn’t there a secondary school yet in Tandale? Who can I talk to and ask? Once you ask people to begin to scratch the surface of an issue, you realize that people aren’t often comfortable asking such questions. Our groups in Dar were not sure whether those important key people would be willing to talk to them at all (and maybe they would not). But this is a good problem to have—it’s where things get interesting, especially once people begin to cross these perceived boundaries. Partners that are knowledgeable about advocacy and those with a “convening” ability are fantastic to bring in at this point. As you can see, the last respondent has a much more nuanced idea of what they hope the information can do—thanks to her experience working on community issues in a leadership role. She anticipates playing an active role to get the information where it needs to go—whether out to the wider community, or targeting it to particular members of government. But the other responses are also important. The desire to be “seen,” in particular, is something we often hear, and it gets into deeper issues of social standing and subtle ways of raising the status of people in a community—toward the longer-term goals of increasing their power in society. An invisible or unheard person/community is easily ignored. This reinforces what we’ve learned elsewhere—there is a group or social aspect to reporting and using information that is different from what we tend to do in the United States. Belonging to a group that is working toward a shared goal, and having physical contact with the group members is critical. Which means . . .
We’ve learned this over and over again, but it’s still left out (or wished out) of the planning process, much of the time. While GroundTruth started working in Tanzania with partners like the World Bank, Twaweza, and Map Kibera, on the ground we had a group that consisted of university students, community members, and members of the Slumdwellers federation. Would this group coalesce into something that enables the feedback loop to sustain into the future? Not on its own. Institutionally ungrounded pilots are simply not going to succeed. It was a fantasy initially that a large university would play that role. Grounding must come from close to the ground. We’ve essentially provided this for the initiative until this point. So during my trip, I revisited the topic of ownership and how to support community members who were so enthusiastic about the potential of the mapping and blogging. I had a great talk with the leader of a civil society organization umbrella group about how to institutionalize a project in a place with few capable non-governmental organizations. We need to be able to work intensively, over a long enough period of time, until a paradigm shift begins to happen. This requires not one-off pilot funding, but sustained funding over a couple of years. Then, and only then, you’ll start to see real results. We’ve been at this for three years in Dar es Salaam, and we’ve seen amazing persistence by the participants, but less than inspiring funding opportunities. We’ve seen contests and hackathons and government-led initiatives, but not investment in the very people who are on the cusp of effectively changing the way citizens relate to their government. Is building a large, all-encompassing feedback system through government going to be what works in this new frontier of development, or is it going to be the messy process of engagement at the grassroots and people’s own experimentation with and ownership of technology that ends up having a chance to finally flip the development paradigm on its head? I will go into this in more depth in a follow-up blog post coming soon. 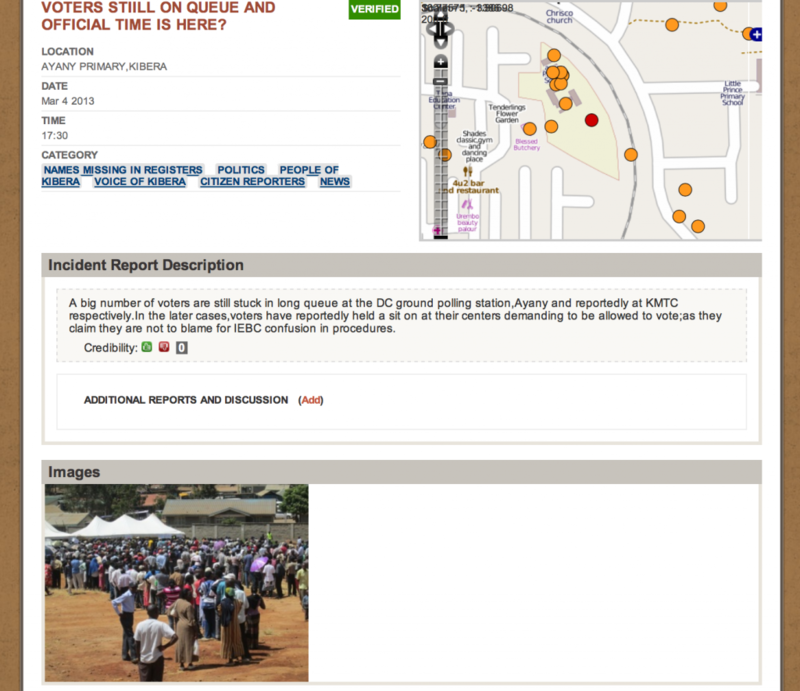 The Kenyan elections were more than a month ago, but a debate continues in the crisis mapping community about whether the various technologies deployed to track and respond to outbreaks of violence were a confused and possibly dangerous mess, or a successful contribution to what was ultimately a peaceful (if disputed) process. The criticism goes on to describe this duplication as irresponsible and dangerous, especially supposing that the submitted information has no real response mechanism. 1) Unprecedented collaboration among technologists, at least at a pilot level. Map Kibera took part in elections monitoring by mapping and reporting through SMS, blogs and video throughout the election period on our multimedia sites, Voice of Kibera and Voice of Mathare in two slums. Kepha Ngito, our executive director, offers this extensive writeup of how the process looked behind the scenes, definitely worth a read. Map Kibera already had been working with Ushahidi-based websites and video news for three years in Kibera, and with blogging and video in Mathare for about two years; therefore neither project was created specifically for the election. Given our status as an established community-based group focusing on reporting and local information, we were ready to take on this event without creating any new technology. As elections neared, more organizations began to set up temporary programming around election reporting. 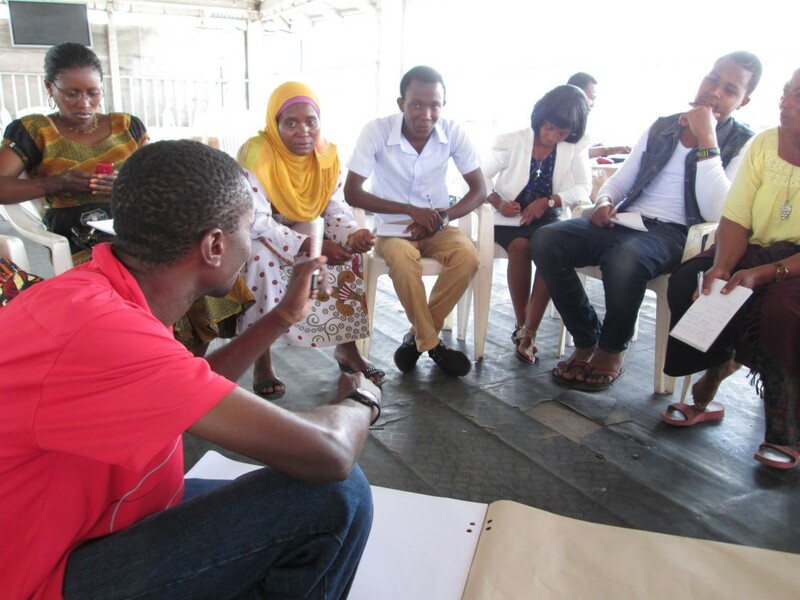 In particular, our team joined events held by Ushahidi around their Uchaguzi platform, and we began to think about how to collaborate: they as a national scope project and ourselves in-depth in two key communities. Ultimately, some members of our team worked throughout the election at the iHub headquarters of Ushahidi to monitor their reports coming in from Kibera and Mathare, and share our more detailed and verified reports with their system. This meant both reports and response could be tightly coordinated. Would it have made sense to have used only one reporting number, that of Uchaguzi for instance? No, because Uchaguzi is no longer active, while Map Kibera is building up a long term citizen engagement including this SMS number. It made more sense to work on interoperability and coordination. What was the key to all the information coming in, and the verification process? It was this background offline coordination that would allow for immediate election-day verification and constant liaising with security groups, both official and community led, in case of any problem. The online-offline coordination often involved both SMS into the system, and phone calls to security or other key people to keep tensions down. I heard a number of claims floating around about technology platforms being directly responsible for police or security response. I would advise that these be investigated closely. In the case of both Kibera and Mathare, if anything it was this type of “online” or SMS-based reporting in conjunction with offline personal and official networks, connected often through ordinary phone calls, which activated response, not a pure technical system. Bringing together the various kinds of technical reporting options with great local networks can create response processes that are effective, but not overly sensitive to false alarm reports. 4) Good citizen election monitoring is not “pure” crowdsourcing. We and others relied on establishing networks and offline meetings and coordination to build participation. Another misconception is that every SMS number was targeted for the general public. Actually, the Map Kibera SMS line was and is primarily used by our volunteer reporters to send information from prearranged locations like polling stations. For the election, aside from our members, the Kibera Civic Watch Consortium sent in many reports during the election. The numbers are publicized to general residents, but operate mostly through carefully cultivated users. I think there is a basic misconception that “crowdsourcing” something like election violence will happen with anonymous individuals. In tight-knit communities, this is simply not the case. They may text into a nationally publicized number, but those reports are not always the ones you want or can rely on. Verification is needed, which means local networks are still key. My hunch is that when people report through a local system the information is more likely to be accurate, because they know the faces behind the tech. Particularly in more marginalized, insecure, or informal communities, people come together based on relationship networks, and being known and trusted as a leader in the community is an earned privilege that does not come easily nor is it taken lightly. People do not often trust something new that is introduced from “outside”. National scale projects targeted to single events like elections should heavily support existing community level initiatives, and community-level initiatives around information need to be long-term investments into the community fabric. This means not just new technology projects which are still rare, but also traditional community media or data-driven local planning groups. 5) We’re still working out what works best in the space, so multiple projects are important for narrowing it down. A top-down model won’t work for citizen-based technology in emergencies, at least not for a long while. While coordination and duplication avoidance is good, we are talking about places where the normal emergency response functions need supplementation and should be supplemented. I don’t know if a single top-down system for emergencies is ever going to work in Kenya, but it certainly hasn’t yet. I’ve seen way too many everyday crises happen with absolutely no response at all save for neighbors helping neighbors (and literally saving each others’ lives on a daily basis). In that sense people need access to options and a variety of ways to draw attention to and publicize an urgent situation. It’s also in the spirit of the technology world to keep trying out new ideas and iterating. On the other hand, it’s true that some might irresponsibly publicize reporting channels that seem to promise response they can’t deliver, and technology is most certainly something we are now seeing organizations use to make themselves look good even at the expense of the public. We should ask whether there were unnecessary institutional barriers or unethical motivations to any lack of coordination or collaborative spirit, and direct our transparency lens that way. If competition for funding or funder requirements inhibited the social benefit of working together, as it usually does, then these incentive systems should be exposed. Also, the opportunism of pop-up and parachute technology projects just a week or so before the election is a distraction, and there were several of these as well. But what I think we’ve seen here is a partial triumph of civic collectivism over the usual silos created by the donor marketplace, which is why I’m seeing the glass as half-full. It could stand to be filled up all the way. 7) A sea-change is underway in terms of how people engage with information in Kenya: they feel it’s their right and responsibility to speak out and to protect peace by countering rumor; and they increasingly feel they have tools with which to do so. This is my hunch, but since 2009, I believe that the positive side of social media has had an impact in Kenya – or at least in Nairobi. I noticed during the election that people expected to be able to counter incorrect news and information sources by using their Facebook account or Twitter or one of the projects referenced here – they have grown used to reporting themselves and no longer rely exclusively on traditional media sources. When they see something happening, they expect someone local – if not themselves, then a neighbor – to be able to take a photo, send a message, somehow communicate. This means that rumors can be countered more quickly, and leaves room for peace activists (most Kenyans) to organize and amplify accurate and helpful messages and at least contribute to the conversation, creating a more balanced discussion. During these elections there was a new sense of the importance and responsibility that citizens have for being information collectors, transmitters, publicizers, verifiers, and the inkling that the standard channels of information aren’t the only ones that exist anymore – and that citizens have the responsibility to not only voice opinions but keep the rumors down, to participate in peace. Real crisis prevention has much more to do with local leadership, coordination, and behind the scenes response than the information that’s necessarily visible online. But that isn’t to say that creating visibility, keeping track of the truth and bringing information out of the dark in close to real time isn’t extremely valuable – it connects and inspires those who want to keep the peace and provides the opportunity for a local counter narrative to the dominant media. Don’t risk missing the bigger story here: the simple act of residents recording actual ground level events themselves will have a long-term transformative impact on society – nowhere perhaps, as profoundly as in places like informal settlements. This post originally appeared at Disruptive Witness. This post also appears on Disruptive Witness. Citizen feedback on development and aid projects has been a kind of “holy grail” for aid for a few years now. The latest discussion comes in a recent blog post, “Consumer Reports for Aid“, by Dennis Whittle of the Center for Global Development. This is one of my very favorite topics, too. And, I eagerly sought the same kind of thing in 2009 when we began working in the Kibera community. But here’s why we might be awaiting such feedback loops – in the model of Yelp or Consumer Reports – until the cows come home, dedicated hackathons notwithstanding. When we tried to activate a citizen feedback loop in Kibera with Map Kibera, we thought that having a communication mechanism for residents to post comments about aid projects on the ground could revolutionize the way not only NGOs practiced, but the way the community viewed and took ownership over development. On Yelp, if I leave feedback, either positive or negative, I feel more connected to the businesses in my community and helping them succeed, fail or improve. In short, I feel a subtle sense of ownership. If the local NGOs and projects in a place like Kibera could be put online and rated by citizens, or various services commented upon in a detailed way, then maybe we’d have some real and meaningful feedback. USAID and big donors would respond to that, not to some puffed up self-reporting. In fact, when we launched Voice of Kibera, that was one of the first ideas we had about what it might become. It wouldn’t necessarily be the news reporting site we have now; maybe it would allow people to mark services and organizations and comment on them. It’s clear to me now why that didn’t happen – though, as you’ll see, we’re still working on the broader goal. 1) It’s hard to overestimate the complexity of a neighborhood of some 200,000 citizens, several tribes, a variety of languages, and little government whatsoever, that has existed in spite of the government’s desire to wipe it out and whose often transient residents have to struggle every day to make a living. I’m talking about one place, but I might be referring to many urban informal or extremely poor neighborhoods in the world which are the target of large amounts of aid dollars. There is a way things get done, and a reason why they get done that way – an entrenched system in which both the aid donors, government, and local actors play a role. People are very sensitive to the micropolitics that could impact their lives much more seriously than in wealthier environments. Offending the wrong person, or pleasing the right one is an important determinant of success. Being in the business of engaging people, soliciting and publicizing their honest and informed views, and getting accurate data out there is a big job, and in my view far too little attention is being focused by techies or donors on the community side of this equation. Ultimately that’s what Map Kibera seeks to do, but it takes a lot more than setting up a web platform. In this context, the role of a trusted representative is very important – who represents local opinion? Is it just whoever gets on Twitter while their neighbors still don’t have a mobile phone? In our excitement over technology there are always those who figure this out and can then hijack the process. System gaming problem? Not solved. 2) International aid is a mainstay of the Kibera and many other poor communities’ economies. This is what the international aid juggernaut has wrought. Yes, most Kiberans work outside of the aid industry and its various projects, but were you to do a critical analysis of the local economy and jobs, you would find that NGO jobs are the best paid and most stable, and come with a reputation upgrade, while “appreciations” – a soda at the end of a meeting, or a bit of airtime, cash or t-shirts – will be given out to a myriad of community members who attend any sort of event or meeting. Therefore, how do you build loyalty and good ratings on your Development Yelp? By intelligently executing a project that everyone relies upon day to day, that has impact, and legitimate sustainability (meaning the NGO jobs “should” be phased out eventually)? Or by winning a popularity contest by fitting the expectations for other perks? It’s a lot easier to do the latter. The incentives and potential rewards for supporting a claim that an NGO is doing great work are very high. Saying something negative can get you in trouble. We’re talking about tight-knit communities here. Why spend time giving critical feedback when it’s potentially going to get you in trouble? 3) In fact, why spend time giving feedback at all? Time and energy are very precious resources when you live in a place where parents are forced to leave small children to play unsupervised all day because they need to work and can’t pay for daycare. You’ll need to distribute some appreciation to get participation, unless participants are using a system for rating large-donor projects they’ve been beneficiaries of (see Danish Refugee Council example below), in which case much of the feedback might be in the form of calling out the continuing need for more assistance. 4) Many might respond that anonymizing this information will solve some of the problems I’ve mentioned. That’s essentially the route that Global Giving went with most of the stories on its Storytelling platform. But in that case, you don’t have very detailed knowledge about specific interventions or programs, which to me is the ultimate goal. Also, in most instances, asking for anonymous information from people is perhaps the purest yet least effective method of crowdsourcing. Anonymous inputs means you cannot hold people accountable for false information, and also removes a key incentive – to have an online presence and visibility. Even with Yelp, that’s clearly a motivator – a little bit of egotism. So how do you make visible the inherent knowledge in a community of what works and what doesn’t? Certainly every Kibera resident has a lot of valuable knowledge, that, for instance, the vaunted bio-toilet is just stinking up the corner and no one’s using its supposed cooking gas. There is indeed a desire in Kibera, at least, to weed out the unproductive and even fake “briefcase” or “ghost” organizations that are supposed to reside there, but which aren’t in evidence on the ground, which means there is some latent incentive to provide data. That’s why we hope our teams on the ground at Map Kibera and others like them will become the trusted informational resource for the community and will do a kind of due diligence on the local organizations and projects. In fact, this is a standard role that journalists play in a community – accountability and investigation. New kinds of citizen journalists and information centers can fill this role in places where there is limited news coverage. These informants aren’t anonymous at all – but they are protected by association with a network and local reputation. In fact, an idea the Map Kibera team had was to create a directory of organizations and projects in the area where each group could have a page explaining what they do. The neutral nature of this project would invite in organizations in order to allow people to know who’s doing what where, and basic transparency would be built in. It would also help those tiny initiatives of regular community members – the orphanages, day cares, and youth groups – without much money or tech savvy to have some visibility and essentially prove their value. Mikel and I worked on this a little bit in a different format with Grassroots Jerusalem at www.grassrootsalquds.net. We are still seeking funding to finish this platform and establish it in Nairobi. Once that’s done, I think we can rely on our dedicated team to fact-check reports and post about various initiatives, and because they’re trusted members of the community, they can retrieve detailed opinions of citizens, both positive and negative and quote them on the site. There is another way this could all work, which is to create a loop about government and large donor projects (those less likely to have a presence in the community) or simply highlight needs that require attention locally. This is more akin to the FixMyStreet concept, calling out local issues which have no project yet attached in hopes of triggering government or other support. We’ve tried to do this in Tandale, a slum in Dar es Salaam. There, we trained a team of reporters who’ve mapped the area and now post blog reports about conditions in the slum. See http://tandale.ramanitanzania.org/blog/. In this case, the loop has so far failed to close on the government or other responder’s side, in spite of initial promise. Here is where an influential third party can play an important role, such as the World Bank or UN. I also found interesting this example of the Danish Refugee Council trying to solicit feedback on its work, which might not be a model to copy but gives a pretty accurate picture of what types of complaints a system might field. This is what a loop would often amount to: “We are requesting for power to charge our mobile phones, in order to reduce the challenges about the power and sent more SMS feedback.” Response: “According to your prioritization, DRC doesn’t provide electricity to any community.” Basically, that’s a no. I’m not sure that gets us much further, yet, than fielding such requests for more assistance. But, it does make public a normally very private exchange between donors and beneficiaries, when they are in that traditional relationship common to development schemes. I think this is a step in the right direction, because the more we open up these processes the more likely they will be open for questioning and productive critique. The fact is that every “complaint” about “service delivery” is actually a citizen claiming a right – clean water, for instance – often in a place where there is no easy solution and there is a systemic and ultimately, political reason why neither NGOs nor government have yet to provide for such needs. Usually, that reason has little to do with the government (or big NGO/World Bank/UN etc) not knowing that the problem exists, sometimes in great detail. The more that trustworthy community information representatives can detail and report and map and publicize and pressure and comment – and, do real journalism about – about the particular issue, the more likely that some downward accountability will be injected into the system. It’s also more likely that community members will begin to understand the forces at work in their neighborhoods and analyze what’s happening around them. It’s hard to imagine an information asymmetry as critical to address as that between residents of poor communities and major players in the development and government arenas, the 6 foot view vs the 30,000 foot.